I'm trying to import my Bitwarden Vault into 1Password, I tried to import from within 1password.com, 1Password app on Windows and macOS, and I even tried MrC's converter. But I'm not able to successfully import my Bitwarden vault, all the items are imported as notes with all the fields mixed up. Is there any easy way to import my Bitwarden data to 1Password? @8arros: It depends on the state of the exported data. What format is it in? What method did you use to convert it using @MrC ’s converter? Bitwarden has two export options, JSON and CSV, since I didn't find any option to import JSON files either on MrC converter or 1Password, I used the CSV. In the converter there's no Bitwarden so I choosed CSV to. You're very welcome. Please let us know how it turns out. Do we need a bitwarden converter? I haven't seen a ton of demand for it, but if you have time to work on it I don't think it would hurt a bit to have one. When wifey goes out of town, I order either the dancing girls*, or make a new converter. The latter is usually the better choice. @MrC - if you feel so inclined, it's clear at least a few people would use it. I'll be taking a look this weekend. maybe even Friday if my day is as free as I'm hoping! I have never been more glad to see an asterisk. The bitwarden converter is now available for your testing. You can find it in the updated converter suite post. Note: I do not have a premium account w/Bitwarden, and do not know if attachments are available in the export file. So this is not supported yet. Thank you! Maybe I'm missing something, I just download the latest download available, but when I open the app there's no option to import a bitwarden file, there's 1Password and then Chrome. Ok, I tried to run the converter through terminal, running High Sierra 10.13.6 and received the following error. Nevermind, using the JSON file everything was imported. I did had one note with one document attached that was not imported. Not a big deal though. Edit 2: Nevermind again, the folders were recreated as tags, other than not importing the note attachment everything worked great! 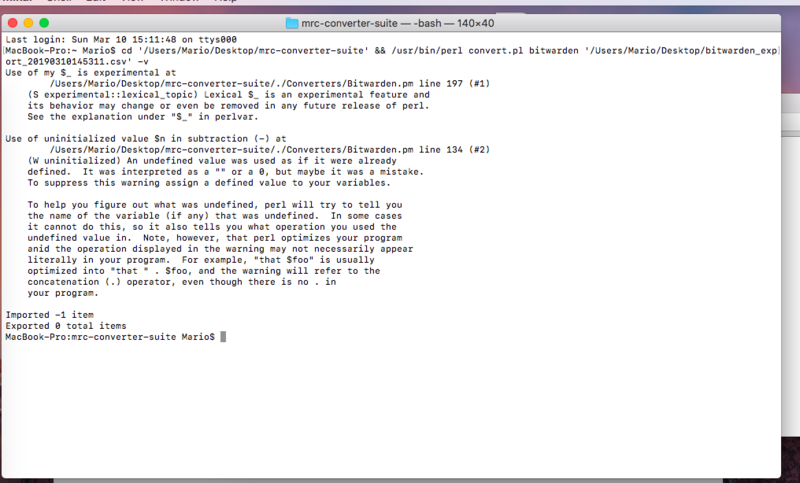 I had forgotten to update the macOSConvertHelper.app, but the converter was present and available via command line. I've updated the suite now. Your error above was that you exported as CSV, not JSON. Looks like you figured that out. Please check out the README file. It guides you through the process step-by-step. I'd like to resolve the missing note + document issue you have. Are you able to provide me with a sanitized export with this one entry? 1Password 7 does not support folders. Tags are used now. Regardless, the converter will only create folders when the --folders option is set, as per the README (see the --folders option). I could try, but after searching a little bit, it looks like that's a Bitwarden problem, not a converter one. Thanks for finding that info. I didn't know if attachments were exported or not, since i could not try with my free account. Still, I would like to be able to at least get the contents of the record imported if possible, but I don't know what is causing the issue. Did the record get exported into the JSON file without the attachment, or is that record not present in the JSON at all? Can you look inside your JSON file to find the note that went missing from the conversion? btw. Your issue with the macOSConvertHelper above, not having the bitwarden converter listed, prompted me to start working on programmatically generating the list of available converters for macOS. I've been using a static list inside the AppleScript, and was unable to auto-generate the list previously. Recent documentation changes I made allowed this to happen. Thanks for bringing this to my attention. I'm sorry, maybe I'm misundestanding or I wasn't clear enough, the note was imported as a note into 1Password. I have that note with all the text in my Secure Notes folder in 1Password. That entry looks like this one in the screenshot below. Ok, great @8arros . I misunderstood. Sounds like you are good then. I've updated the documentation in the bitwarden converter to indicate that attachments are not exported. I will, again, thank you all for your help, and thank you @MrC for all the hard work. Thank you for following up here @8arros and also to @MrC as always for the excellent work and support on the converter suite.